College funding services is a company that helps students and parents find the most ideal loan packages and assists with students receiving merit based aid with their school tuition. They are also a company that advises students on their college applications, so students are more likely to enter their dream college. 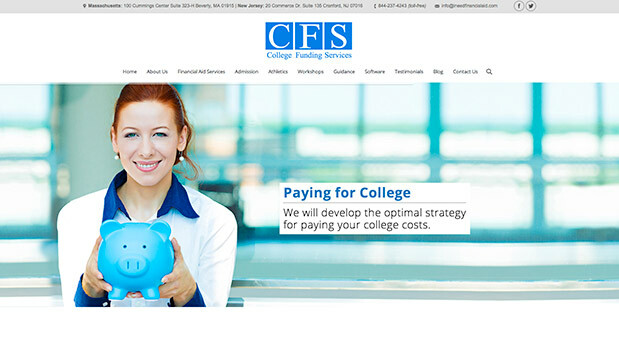 College Funding Services was looking to create two separate website’s for their clientele. 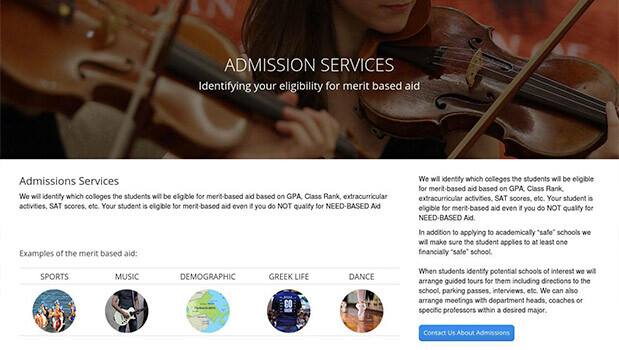 We developed a landing page that provides basic content to parents and students who need to quickly get into the application process. 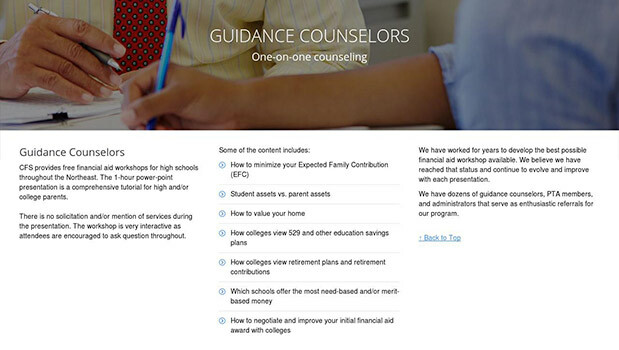 The landing page has 3 calls-to-action giving student’s and/or parents the option to select one of the three financial aid options. We also constructed a main company website that holds the bulk of the content about the company including services, blog, and calendars for meeting with guidance counselors. The company website is an immersive experience suppling tools like educational software, guidance counselor sessions, and workshops. It was apparent to CFS that they needed to a hub that students and parents could return to if they needed continued education about their college financial options. CFS requested that we add a Facebook post feed to their company website to keep their students updated on their latest event and increase the number of likes on their Facebook page. Due to the large number of workshops that College Funding Services hosts, they needed a calendar that would be easily accessible to students and could be updated by multiple employees at the business. We found the best fit by implementing a Google calendar into the company website that updates automatically upon teachers adding the events to the Google calendar. Satisfied with the project, CFS will now be expanding the content of their website through documenting events and images on their company blog.